The countdown to Christmas has begun and we have a fab list of events coming up in the area during the festive season: from ice-skating to fabulous Xmas markets, this is wonderful time of year in French-speaking Switzerland. Remember to keep checking these listings regularly as we will be updating this post with more events each week! 4th-5th December 2015: 38th edition of the Course de l’Escalade in Geneva. The Christmas spirit is spreading fast in Switzerland and winter sports are a huge part of it. Notwithstanding the very cold weather, one of Geneva’s most famous winter sporting events is the Course de l’Escalade, taking place in the city’s old town. This race is open to everyone: professional runners to beginners, children and adults alike. Distances vary between 2km to 8km depending on the category and consist of 1, 2 or 3 laps. All races take place in the narrow streets of the old town and finish at the Parc de Bastion. The non-competitive Marmite Race is the highlight of the event. All those who take part run the 3,4 km together, dressed-up in a fancy costume and they definitely try to outdo each other with their fun, original choices! This is a fun day-out for the whole family, so be there if you can. You can read about last year’s Escalade Race in our previous post. Saturday 12th December 2015: Christmas Family Run in Divonne-les-Bains (France). 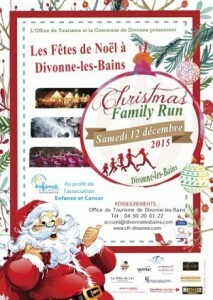 This is a family relay race to benefit the “Enfance et Cancer” association. Take part in the run or just attend as a spectator: this is going to be a great day-out for the whole family – there will be an ice sculptures exhibition, free concerts, hot chocolate, fun activities and much more. The run is open to every family composed of a man, a woman and a child (the young participant must be the child of one the 2 adults), and to individuals who’d like to run the male/female individual races. Registration fee is €29 per family at Divonne’s Tourist Office. 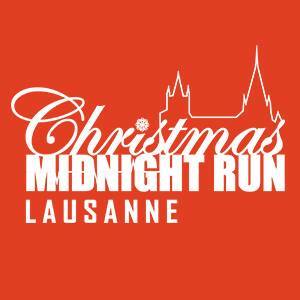 Saturday 12th December 2015: Christmas Midnight Run in Lausanne (Place de la Riponne). Join this midnight race & dress up as Father Xmas if you wish, you can run alone, with friends, colleagues or as a family. From 6pm, visit the official website for full programme details. Sunday 20th December 2015: Coupe de Noël at the Jardin Anglais in Geneva. This is a unique and long-standing sport’s event in the city of international peace, now in its 77th edition. Watch as hundreds of people jump into the freezing lake for the world’s biggest swimming race in open waters. Participants include the so-called “groupes humouristiques” who participate wearing weird & wonderful costumes (including Santa hats!). Click here for the full programme. The first group will jump into the lake at 9am, Santa will arrive at around 10am with plenty of gifts for the little ones. Whether you believe it or not, you CAN visit Santa’s house at the Hameau du Père Noël in Andilly (France) all year round (a secret probably worth keeping from the little buttons…). 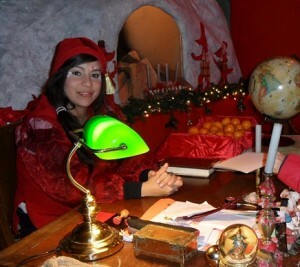 You can find out more about our visit to Santa’s house in Andilly in our previous post. For exact opening times and ticket prices, take a look at their official website. On the Swiss side, the House of Santa Claus at Rochers-de-Naye – nestled at an altitude of 2042 metres above Montreux (VD) – will open on the 20th of November 2015. Don’t miss the Santa Claus train, face-painting sessions, stories and photos with Santa! Having been to both Santa’s abode in Andilly (FR) and Rochers de Naye (CH), we personally think that Andilly is better for younger children: it’s easily accessible and there’s a lot more to see inside Santa’s house. Rochers-de-Naye is probably best enjoyed with older children, who can be patient and sit still during the train ride up as well as appreciate the stunning mountain-top view over Montreux. However, we’re very happy to share a great tip from Masha Bobyleva who recommends to drive up to the Christmas Village and take the train up to Santa’s House from there. The train ride from the Christmas Village is only 5 minutes and much easier to enjoy with young children than the longer ride from Montreux. Keep abreast of all the events and free Christmas activities with our special festive listings, just click here to see them all! This is also the season to enjoy some great skiing & sledging with your little buttons, see our previous post for some advice on ski-schools for kids and great winter sledging spots. One of the things we love the most about winter in Geneva is the access to some fabulous ice-skating rinks: they’re fun, they’re mostly free of charge and you can often hire skates for as little as 2 CHF. Here’s a selection of our favourite ones, but remember to check in your area as most villages and communes have their own winter skating-rinks. Open until 28th February 2016: Patinoire des Bastions, Geneva – open Tuesday to Sunday, entry is free and skates can be hired for 2CHF. Click here for exact opening times. Open until 28th February 2016: the Patinoire saisonnière in Carouge is at the heart of the city’s Xmas celebrations: the atmosphere is great and you’ll be skating right in the centre of beautiful Carouge. Don’t miss the super-cool “Ice Bar” for a hot drink or a fondue. From this year, renting skates for children up to the age of 6 will be free of charge and only 2CHF for older children and adults. Open until March 2016: the patinoire des Vernets has 2 ice-rinks, a smaller one outdoors and a larger one indoors for matches & sports events. Open until 26th March 2016: the Patinoire des Charmilles in Geneva is smaller but it’s great fun for families: on Wednesdays & Saturdays from 2pm to 6pm they hold “Glisse en musique” skate & dance sessions for families that are really good fun! Entry is free and skates can be hired for 2CHF. Click here for opening times – the rink is closed on Mondays. Every Saturday from 9am to 10am get your little girls suited & booted for ice-hockey beginners lessons suitable from age 4 at the patinoire in Grand-Sacconex! Every Wednesday from 1pm to 2pm and every Sunday from 11am until midday they will also offer free “Cours d’initiation au patinage” open to all. Bookings to be made in advance at the ice-rink – tel. 079 079 958 84 48. Patinoire Grand-Sacconex – Campagne du Château – 1218 Le Grand-Saconnex (GE). 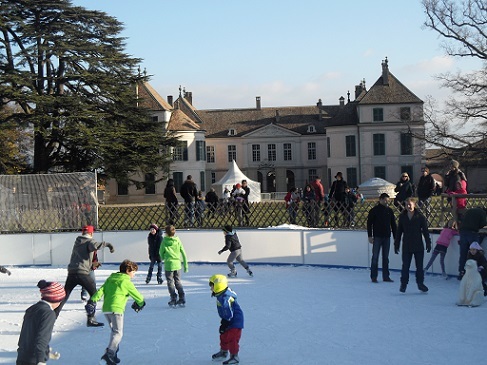 There are some great ice-skating rinks in Canton Vaud as well (our family’s favourite is La Patinoire de Terre Sainte in Coppet with its dazzling views over the château), so if you’d like to have a go you can find the complete list here. Open until March 2016: the Patinoires in Lausanne include the Patinoire de Montchoisi, the Patinoire de Malley, Flon Patinoire and the Patinoire de la Pontaise. See the official Lausanne website for more details. 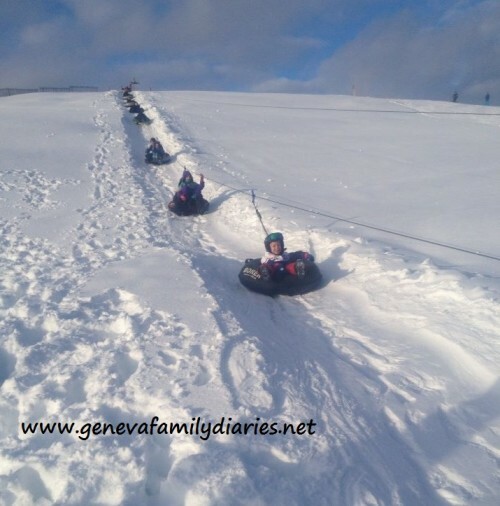 You can also check our previous posts to find all the best child-friendly places to enjoy a delicious and stress-free Sunday brunch with your little buttons or the best indoor play centres in Geneva, Vaud and nearby France. And if the Sunday blues hit you don’t fret, we’ve got some great tips for that too! On those gray, drizzly winter days when nothing seems to placate your little buttons, remember you can visit your local ludothèques for a bit of free-play and some light relief. 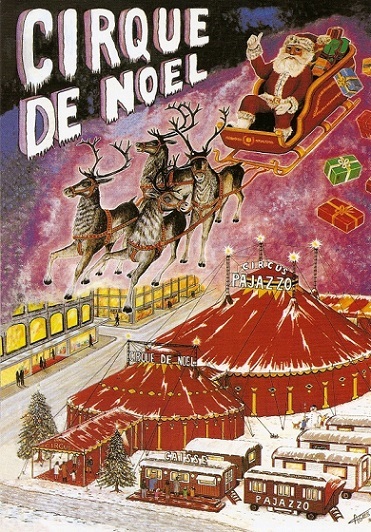 21st November 2015 until 10th January 2016: Cirque de Noël at the Plaine de Plainpalais in Geneva. A great family show, suitable from age 2. Visit the official website for prices & to book your tickets. 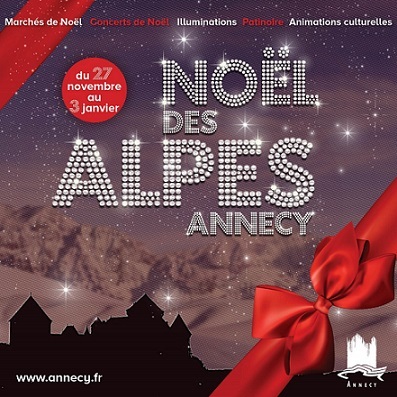 27th November 2015 until 3rd January 2016: Noël des Alpes in Annecy (France). Check out the official website of this beautiful French town for more details on all their Xmas activities, gourmet & crafts markets, ice-skating rink, fête foraine and amazing Xmas lights. 29th November, 6th-20th December 2015: Noël de Carouge, a wonderful series of Yuletide celebration in the pretty town of Carouge including Sunday openings for local boutiques, Xmas market from the 12th to the 14th of December, free live concerts and much more. See the official website for full details. 1st-23rd December 2015: “En Avent toute, destination Noël !”, Xmas book readings in French suitable for ages 5+ at the Bibliothèque Saint-Jean in Geneva (Avenue des Tilleuls 19). The readings will take place Tuesdays to Fridays at 5pm. FREE ENTRY, no advance booking required. 1st-23rd December 2015: Calendrier de l’Avent, story-times, Christmas workshops and afternoon snacks at the Bibliothèque de Carouge and the BiblioQuartier des Grands-Hutins in Carouge. Story times in French are suitable from age 2 and workshops from age 4. You can download the full programme here. 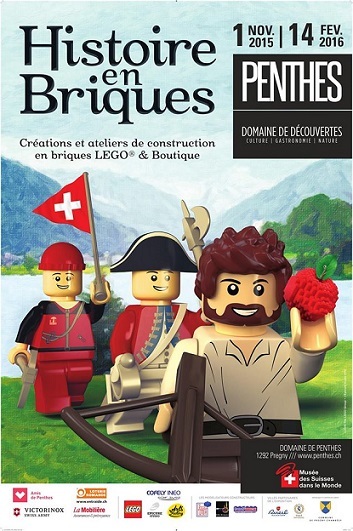 Wednesday 2nd December 2015: “Histoire en briques – ateliers enfants” at the Musée des Suisses dans le Monde in Geneva (Pregny). Suitable for children aged 4 to 12, these fun workshops running from 2pm until 4pm will include a visit to the exhibition and a workshop in French. Participants have to buy a ticket to the exhibition but the workshop itself is free, places need to be booked in advance at secretariat@penthes.ch or 022 734 9021. Children must be accompanied by an adult. Wednesday 2nd December 2015: L’île aux libellules, free show and Japanese story time suitable from age 6 in the Auditorium of the new MEG museum in Geneva (Musée d’ethnographie de la Ville de Genève, Boulevard Carl-Vogt 65-67). From 4pm to 5pm. FREE ENTRY and no advance booking required, but places are limited so get there early! Wednesday 2nd December 2015: “Une vie ailleurs? Les extremophiles” workshop for kids – Animation du mercredi from age 7 at the Muséum d’histoire naturelle, Genève (1, route de Malagnou). In connection with the current exhibition “Exoplanètes”, these free Wednesday workshops will take place from 2pm to 4.30pm (second floor). Wednesday 2nd December 2015: “En selle! Le MAH à cheval!”, part of the Mercredis Family at the Musée d’art et d’histoire in Geneva (Rue Charles-Galland 2). Children aged 6 to 10 accompanied by an adult are welcome every Wednesday at 3pm to discover all about the museum collections in a fun, interactive way. FREE ENTRY, no advance booking required. Wednesday 2nd December 2015: Jours d’ouverture aux familles at the Maison de la Créativité in Conches (7, chemin Calandrini). These family activities will take place in the afternoon from 2.30pm to 5pm. Entry is 3CHF per adult and per child aged 2+. © 2015 Maison de la créativité, Conches (GE). Wednesday 2nd December 2015: Mini and Petits Rendez-Vous for children at Geneva’s MAMCO. These are free, interactive guided tours for kids aged 2 to 4 (Mini rendez-vous) and 5 to 10 (Petits rendez-vous) accompanied by an adult. The tours start at 3.15pm. FREE entry, no advance booking required. 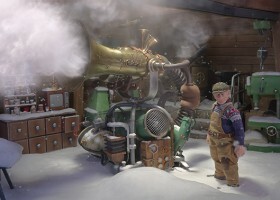 2nd, 6th, 8th, 9th, 13th, 15th, 16th December 2015: “Little Black Movie December sessions”, a selection of delightful short Norwegian movies for children at the Cinémas du Grütli in Geneva (16, rue du Général Dufour); Onex, Meyrin, Maison CIViQ and Chêne-Bourg, starting at 3pm, 3.30pm or 4.30pm. Check the official website for full details. Ticket prices 5CHF up to the age of 10. 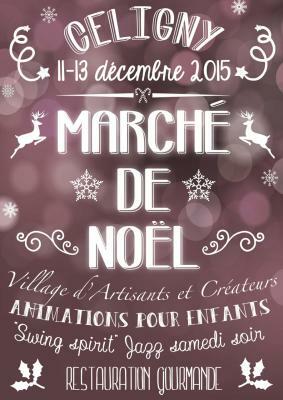 2nd-6th December 2015: Marché de Noël au Château de Coppet. 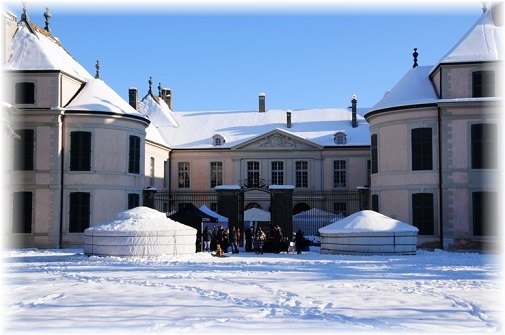 One of the most elegant, exquisite and charming Xmas markets in the area, taking place in the beautiful setting of Coppet Castle’s gardens and interior rooms. From handmade, unique gifts to exclusive wines and foodie treats, you’ll find something to please everyone. But even if shopping isn’t your thing, it’s still worth a visit as there will be “Atelier de biscuits de Noël” workshops for kids; “Atelier de Décoration de Pain d’Épice”; arts & crafts workshops in the Mongolian yourte tent, story times and face-painting. 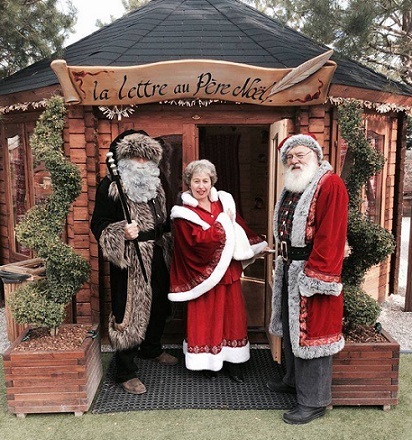 Last but by no means least, your little ones can have a close encounter with Santa himself inside the Cabane du Père Nöel on Wednesday 2nd; Saturday 5th and Sunday 6th of December. Take a look at their full programme online for full details and opening times. Get ready to celebrate in style – this is the place to go for unique gifts and stocking-fillers and the best setting to soak up all the festive magic you crave. 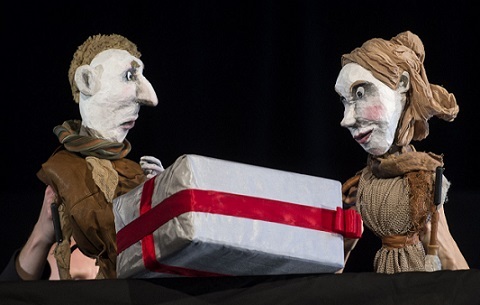 2nd-20th December 2015: “Le roi tout nu”, a delightful puppet show suitable from age 4 inspired by Andersen’s famous tale “The Emperor’s New Clothes” at the Théâtre des Marionnettes de Genève (Rue Rodo 3). See the theatre’s official website to reserve your places. 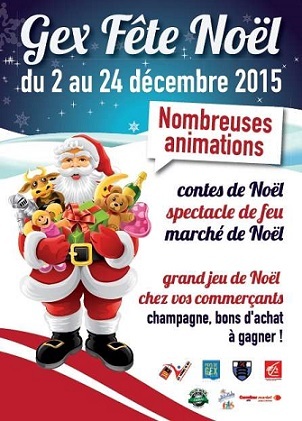 2nd-24th December 2015: Gex Fête Noël, Xmas celebrations in Gex (France) which will include plenty of fun activities for the little ones such as Xmas story times and workshops, puppet shows, fireworks, and close encounters with real sledge dogs! Download the full programme here. FREE ENTRY to all activities and workshops. 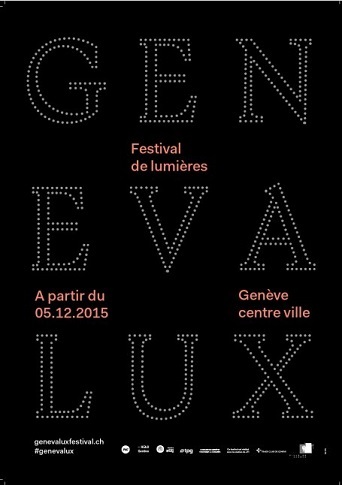 Thursday 3rd December 2015: Inauguration du Geneva Lux, festival de lumières from 5.30pm at Pont de la Machine in Geneva. Don’t miss the grand opening of Geneva’s Lights Festival! A staggering half-million LED lights and over 14km of Christmas light garlands will light up the city of Calvin during the festive season around Rue du Rhône, Place Longemalle, Bel-Air and l’Ile Rousseau. FREE ENTRY. Friday 4th December 2015: “La Parade du Père Fouettard et de la Chauchevieille” from 5.30pm until 8pm at the Parc Gourgas in Geneva. As the old legend tells us, the Père Fouettard (which translates as “Father Whipper”) is the fearsome character who accompanies St. Nicholas in his rounds on the 6th of December. While St. Nicholas is well-known for bringing gifts and sweets to all well-behaved kids, Père Fouettard brings lumps of coal for those who have been naughty. Every year, the Maison du quartier de la Jonction in Geneva keeps the tradition alive with the “Parade du Père Fouettard et de la Chauchevieille”, a great family event to counterbalance the upcoming Xmas madness with a bit of….dark humour! 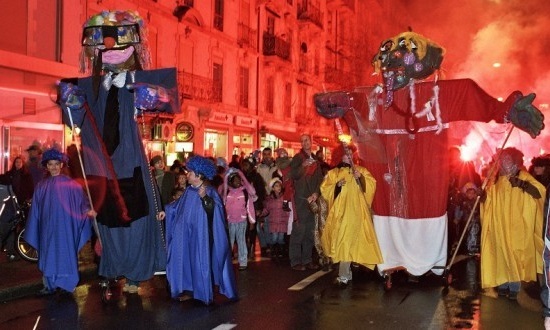 The kids parade will start at 5.30pm from the Parc Gourgas, through the Jonction neighbourhood and back at the Parc Gourgas around 6.30pm for the final bonfire where Père Fouettard and his scary sidekick “la Chauchevieille” will have their heads burned at the stake. The parade is great fun, with live music and orchestra, circus artists, vin chaud, risotto, tangerines and the frightful Père Fouettard, of course! FREE ENTRY. 4th-5th December 2015: 38th edition of the Course de l’Escalade in Geneva. 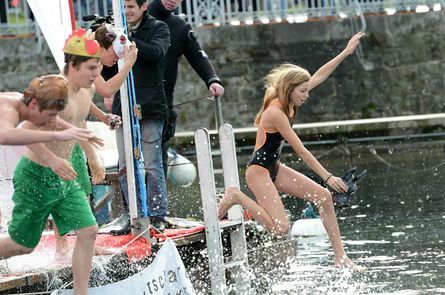 One of Geneva’s most famous winter sporting events is the Course de l’Escalade, taking place in the city’s old town. This race is open to everyone: professional runners to beginners, children and adults alike. Distances vary between 2km to 8km depending on the category and consist of 1, 2 or 3 laps. All races take place in the narrow streets of the old town and finish at the Parc de Bastion. The non-competitive Marmite Race is the highlight of the event. All those who take part run the 3,4 km together, dressed-up in a fancy costume and they definitely try to outdo each other with their fun, original choices! This is a fun day-out for the whole family, so be there if you can. You can read about last year’s Escalade Race in our previous post. 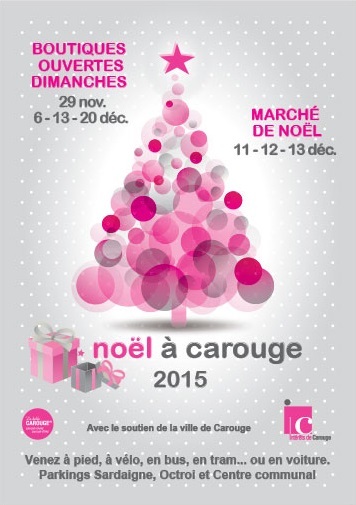 4th-13th December 2015: Grand Marché Couvert de Noël in Morges (VD). 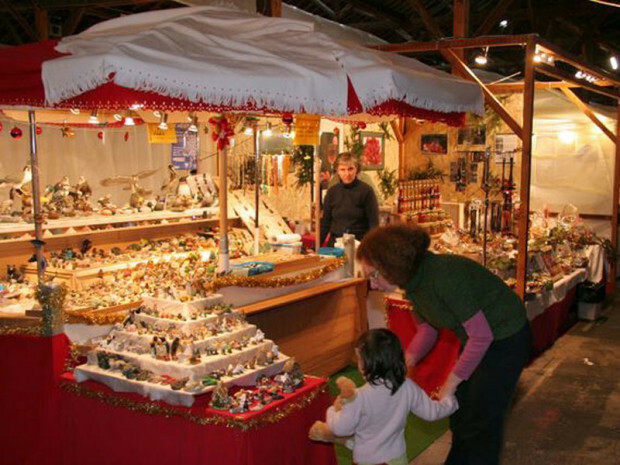 This is the biggest indoor Christmas market in French-speaking Switzerland and takes place in the great wooden hall next door to the Morges railway station. More than 160 craftsmen & women will showcase their creations, including blown glass, pottery, flower decorations, textile products, wooden objects, ceramics and of course delicacies such as jam or foie gras…Open from 4pm-10pm on weekdays; 10am-8pm on Saturday and 10am-7pm on Sunday. Closed on Monday 7th and Tuesday 8th of December 2015. FREE ENTRY. Grand Marché couvert de Noël – Halles CFF Morges © Sacha Fehlmann. Courtesy of Morges Tourisme. Saturday 5th December 2015: “Dinosaures, fossils et autres aventures de la Terre Animation Géosciences”, fun workshops for kids aged 6+ at the Muséum d’histoire naturelle, Genève (1, route de Malagnou). A fun way to discover more about fossils and dinosaurs, these free Saturday workshops in French take place at 2pm, 3pm and 4pm. Saturday 5th December 2015: Atelier Pizza, every Saturday morning from 10.30am to 11.30am at Signal de Bougy. For ages 5 to 12, let your little ones learn the ropes of authentic pizza making with a professional pizzaiolo, they will also be able to eat up their yummy creations once they’re cooked. 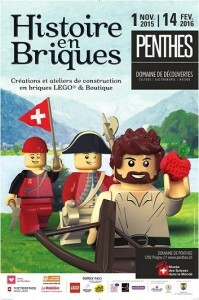 The workshop costs 20CHF per child, places must be reserved at signal.bougy@gmvd.migros.ch or +41 58 568 31 50. 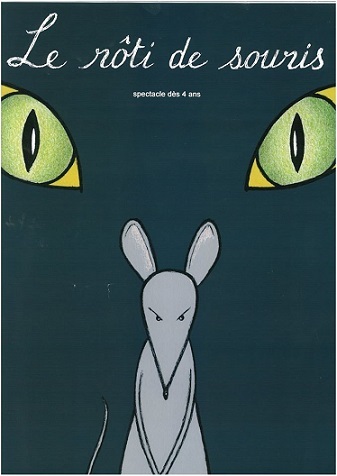 5th-6th December 2015: “Le rôti de souris”, theatre show for kids at the Espace Vélodrome in Plan-les-Ouates at 4pm. The show is in French and is suitable from age 4. Tickets are 10CHF per person/child and can be bought from FNAC, online or directly at the door. 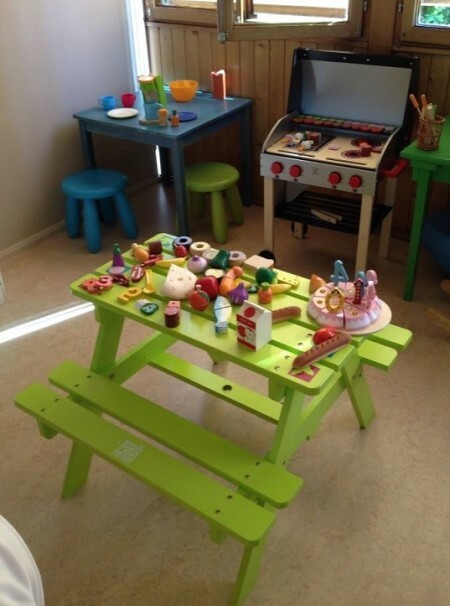 “Le rôti de souris” – age 4+, Espace Vélodrome, Chemin de la Mère Voie 60, 1228 Plan-les-Ouates (Phone:022 884 64 60). 5th-6th December 2015: Fabrication de cadeaux de fin d’année at the Maison Vaudagne in Meyrin (Centre de Loisirs de Meyrin, Avenue de Vaudagne 16) from 10am to 5pm. A great family event offering creative workshops for all ages, including cookery, wood carving, jewellery, candles, lip balm making and much more. A small contribution will be required towards the cost of materials. 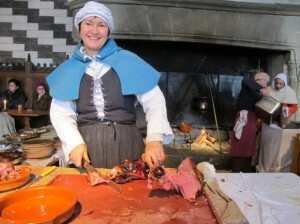 5th-6th; 12th-13th; 19th-20th December 2015: Medieval Market at Chillon Castle, open from 10am to 5pm at weekends. Experience a return to days of yore, an unforgettable opportunity to go back in time and explore the history, the customs and the daily life of the Middle Ages illustrated by people in period costumes. Don’t miss the medieval story-times for little ones, fun shows and medieval dances, as well as father’s Xmas very own desk where you’ll be able to write and post your letter. Family entry tickets cost 35CHF. Sunday 6th December 2015: Free entry to all museums and exhibitions in Geneva, a special initiative organized by the city of Geneva offering free access to permanent and temporary exhibitions on the first Sunday of every month. Sunday 6th December 2015: Non-anniversaire de l’art fun art event for kids aged 6 to 12 and Petits Rendez-Vous for children at Geneva’s MAMCO. The tours “Quel désordre ! — What a mess!” will be in French and English, suitable for kids aged 5 to 10 accompanied by an adult. The tours start at 11.15pm. FREE entry, no advance booking required. 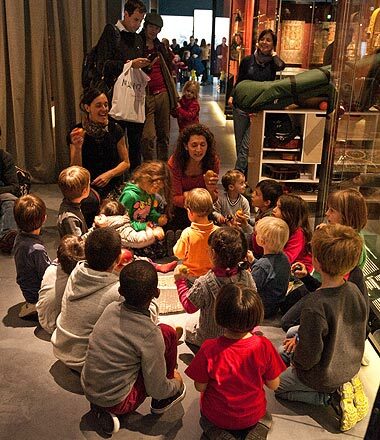 Sunday 6th December 2015: “Tohu Wa Bohu en voyage – special Asie” story-time songs and music for children at Geneva’s MEG museum (in French). Suitable for toddlers from age 2, the first session will take place from 4pm to 4.45pm in the museum’s foyer, and the second one from 5pm until 5.45pm. FREE ENTRY, no advance booking required. Children must be accompanied by an adult. 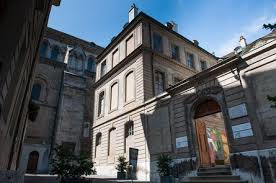 Sunday 6th December 2015: “Construis ton système solaire de poche – Atelier” free workshops for children aged 6+ at the Muséum d’histoire naturelle, Genève (1, route de Malagnou). In connection with the current exhibition “Exoplanètes”, these free workshops will take place at 11am until 12pm on the second floor. FREE ENTRY, no advance booking necessary. Sunday 6th December 2015: “Sommes-nous seuls dans l’Univers?” – free guided tours for families and children aged 7+ and accompanied by an adult at the Muséum d’histoire naturelle, Genève (1, route de Malagnou). In connection with the current exhibition “Exoplanètes”, these free Sunday tours will take place at 2pm on all floors. The guided tour in English “Are we alone in the universe?” will take place at 3.30pm. 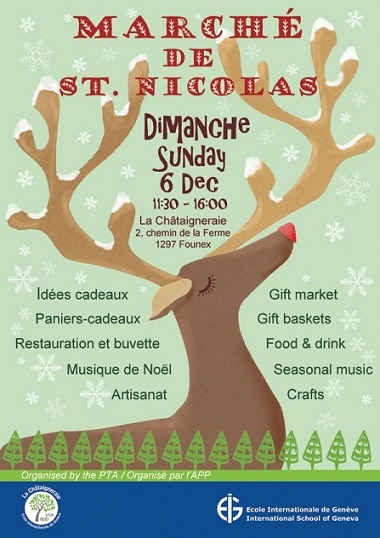 Sunday 6th December 2015: Marché de St Nicolas at La Châtaigneraie Ecolint campus, open from 11:30am to 4pm. The Marché is the perfect opportunity to get into the festive spirit and shop for special gifts. Enjoy browsing through over 30 stalls selling crafts, jewelry, Xmas wreaths, cards and gift items. If you’re feeling peckish, you can indulge in a vin chaud or choose from delicious home made cakes. You can check your young children into the creche and then be free to browse, shop and eat at your leisure. Bid on their Silent Auction of gift baskets with many unique and specially selected items. Please encourage your friends and neighbours to come as this event is open to all. FREE ENTRY. Sunday 6th December 2015: Marché de Noël de Dardagny (GE). From 10am until 5pm at the Salle Polivalente in Dardagny, with donkey rides for kids, handmade gifts and gourmet delicacies from the area. FREE ENTRY. Sunday 6th December 2015: meet St-Nicolas, the Père Fouettard and their donkey at La Cure in St-Cergue. They will end their tour at the restaurant Franco-Suisse. 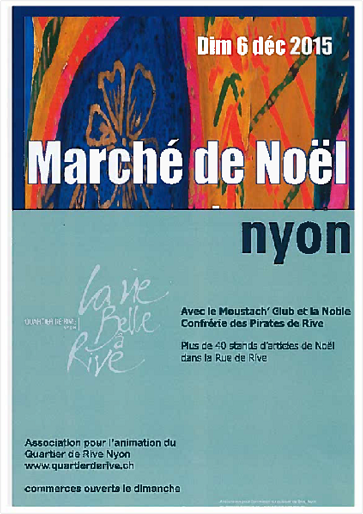 Sunday 6th December 2015: Marché de Noël in Nyon (VD) on Rue de Rive. 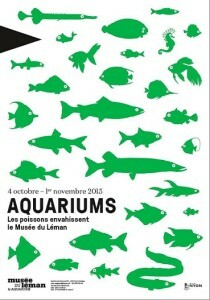 until 6th December 2015: Aquariums exhibition at the Musée du Léman in Nyon (VD). The exhibition has been extended due to its great success, so make sure you go before it ends! Wednesday 9th December 2015: Marché de Noël des enfants at the Parc des Bastions in Geneva. From 2pm to 5pm children from various schools in Geneva will be selling their wares in what is probably the loveliest kids Xmas market in the world! 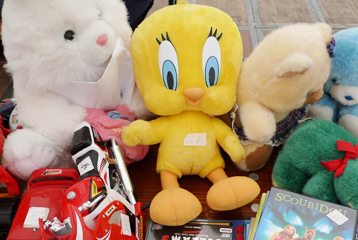 Children are welcome to sell, buy or exchange books, toys and other Xmas treasures, entry is free for all and a snack will be offered to all children at the end of the afternoon. Wednesday 9th December 2015: Histoires et goûter de Noël at 4pm at the Bibliothèque de Minoteries in Geneva (Parc des Minoteries 3-5). 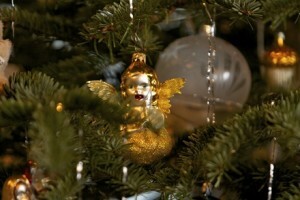 Christmas stories in French, free snack for children aged 4+. FREE ENTRY, no advance booking required. Wednesday 9th December 2015: Jours d’ouverture aux familles at the Maison de la Créativité in Conches (7, chemin Calandrini). These family activities will take place in the afternoon from 2.30pm to 5pm. Entry is 3CHF per adult and per child aged 2+. 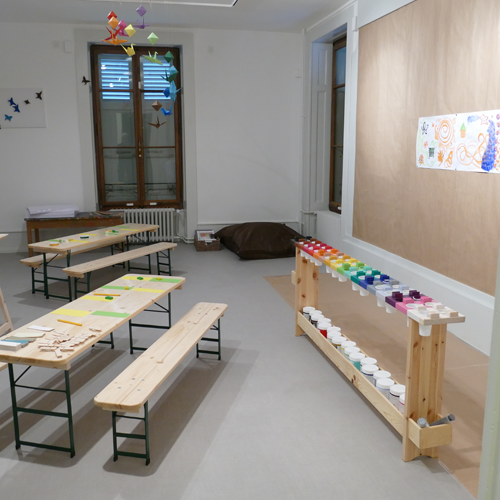 Wednesday 9th December 2015: “Yakari- ateliers enfants” at the Musée des Suisses dans le Monde in Geneva (Pregny). Suitable for children aged 4 to 12, these fun workshops running from 2pm until 4pm will include a visit to the exhibition and a workshop in French. Participants have to buy a ticket to the exhibition but the workshop itself is free, places need to be booked in advance at secretariat@penthes.ch or 022 734 9021. Children must be accompanied by an adult. Wednesday 9th December 2015: “Des couleurs et des formes”, part of the Mercredis Family at the Musée d’art et d’histoire in Geneva (Rue Charles-Galland 2). Children aged 6 to 10 accompanied by an adult are welcome every Wednesday at 3pm to discover all about the museum collections in a fun, interactive way. FREE ENTRY, no advance booking required. Wednesday 9th December 2015: “Une vie ailleurs? Les extremophiles” workshop for kids – Animation du mercredi from age 7 at the Muséum d’histoire naturelle, Genève (1, route de Malagnou). 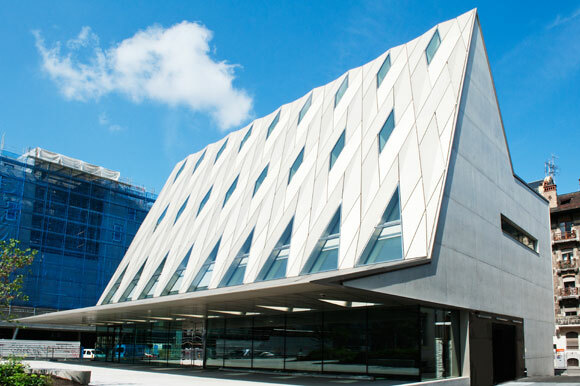 In connection with the current exhibition “Exoplanètes”, these free Wednesday workshops will take place from 2pm to 4.30pm (second floor). 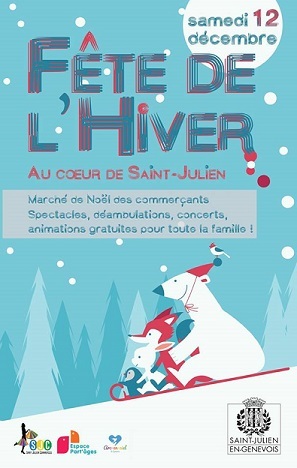 Wednesday 9th December 2015: “Une nuit d’hiver au Bois-Joli”, free Christmas show in French for children aged 3+ at the Bibliothèque Saint-Jean in Geneva (Avenue des Tilleuls 19). The show begins at 4pm, FREE ENTRY with no advance booking required. Wednesday 9th December 2015: “Changeons de visage” Petits Rendez-Vous for children at Geneva’s MAMCO. These are free, interactive guided tours for kids aged 5 to 10 accompanied by an adult. The tours start at 3.15pm. FREE entry, no advance booking required. 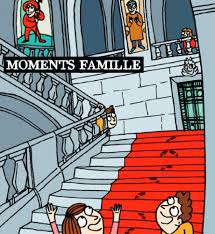 Wednesday 9th December 2015: Noël au Château, Xmas story times at 2pm and 3.30pm at Nyon Castle (Place du Château 1260 Nyon) with Fabienne Naegeli. Suitable from age 5, FREE ENTRY but it’s advisable to book your place by email at info@chateaudenyon.ch or by phone at 022 363 83 51. 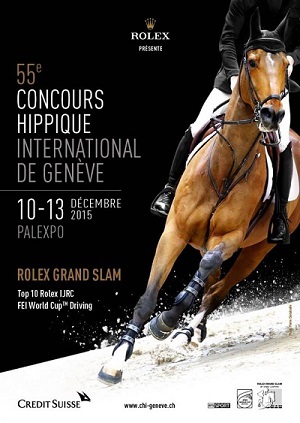 10th-13th December 2015: 55e Concours Hippique International de Genève at Geneva Palexpo. Created in 1926, the CHI Geneva is one of the world’s most prestigious equestrian competitions. Each year, Palexpo, welcomes the very best riders and drivers of the planet on the biggest indoor arena. Voted five times the Best Indoor Competition by the Année Hippique, the CHI Geneva is part of the Rolex Grand Slam of Show Jumping alongside the CHIO Aachen (GER) and the CSIO Calgary (CAN). 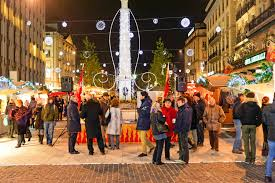 11th-13th December 2015: The Escalade in Geneva is the city’s most famous historical festival. 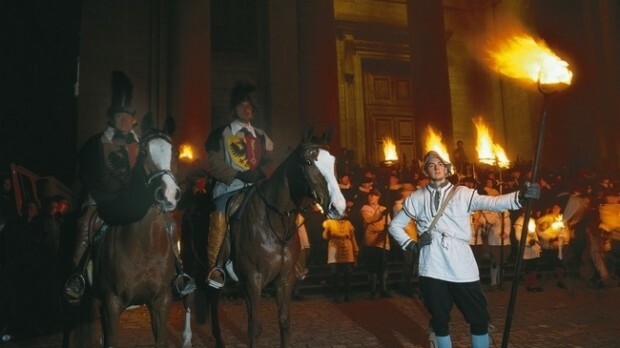 These historical celebrations will see Geneva’s old town take a step back in time to celebrate the Duke of Savoy’s failed attempt to conquer the city in 1602. The re-enactments and procession in the old town are organised by the Compagnie de 1602, so check out their website for details of all the events in order to ensure you won’t miss out on anything. From markets to storytelling, special torch-lit guided tours to hot soup and mulled wine this is truly one of Geneva’s most glorious events. Remember as well that only on this occasion you are allowed to visit the Passage de Monetier, which takes visitors along the base of the old fortification walls under the Cathedral, so definitely one more reason to delve deep into Geneva’s ancient history. Click here to download the full programme in English, and here to learn more about the true story of L’Escalade. 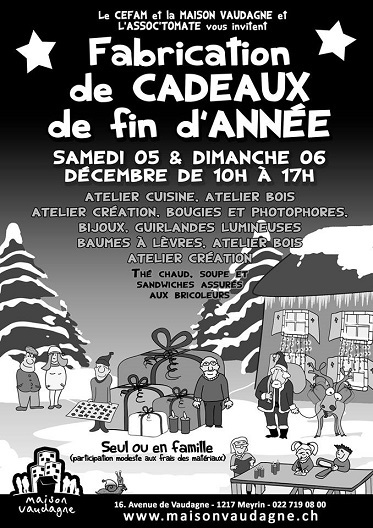 11th-13th December 2015: Marché de Noël in Céligny (route des Coudres 76). You will find 18 wooden huts selling unique gifts, live jazz music, fun activities for kids and scrumptious food stalls. FREE ENTRY. 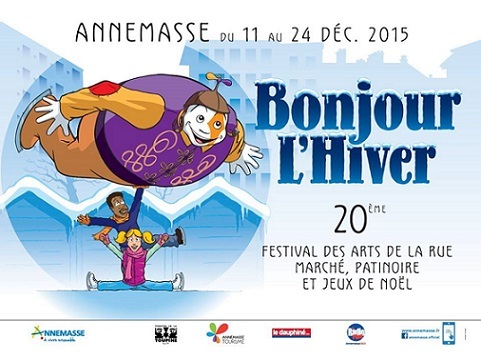 11th-24th December 2015: Bonjour l’Hiver, a winter & Xmas celebration the whole family will enjoy. 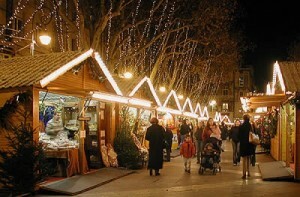 Don’t miss the Xmas market, the Street Arts festival & the Xmas village in Annemasse old town (France). FREE ENTRY, see the official website for full programme details. 11th December 2015-3rd January 2016: Le fabuleux village des Flottins in Evian (France) is a one-of-a-kind alternative to the seasonal Xmas markets. This magical, mysterious village filled with street entertainers, music, exhibitions and art installations will keep the whole family enthralled – you will also be able to do your Xmas shopping done, as local shops will remain open until 8pm in the evenings. Entry to the event is free, visit the official website for full programme details. Saturday 12th December 2015: “Dinosaures, fossils et autres aventures de la Terre Animation Géosciences”, fun workshops for kids aged 6+ at the Muséum d’histoire naturelle, Genève (1, route de Malagnou). A fun way to discover more about fossils and dinosaurs, these free Saturday workshops in French take place at 2pm, 3pm and 4pm. Saturday 12th December 2015: “Marmite de l’Escalade à la patinoire” in Carouge from 3pm. Break up and savour the delicious chocolate ‘marmite’ and then get your ice-skates on! FREE ENTRY. Saturday 12th December 2015: “Théo dort, réveillons-le! L’Escalade au musée“, story-time and flashlight guided tours suitable from age 4 at the Musée International de la Réforme (Rue du Cloître 4 Cour St-Pierre). Running every hour from 5pm to 8pm, entry is 6CHF per person, you must register online here. 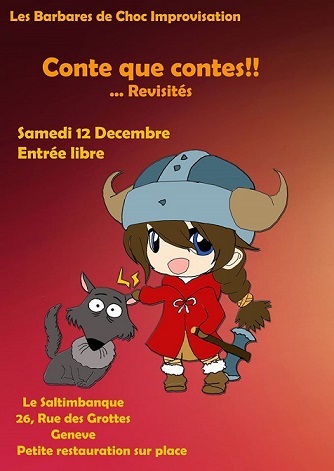 Saturday 12th December 2015: “Conte que contes!”, story time in French by Barbares de Chocolat, where famous children’s tales will be revisited in a fun, interactive way. FREE ENTRY, donations will be gladly accepted at the end of the show. The performance will take place at Le Saltimbanque in Geneva (26, rue des Grottes) at 8pm. Saturday 12th December 2015: Jours d’ouverture aux familles at the Maison de la Créativité in Conches (7, chemin Calandrini). These family activities will take place in the morning and afternoon: 9.30am to 12pm and 2.30pm to 5pm. Entry is 3CHF per adult and child aged 2+. 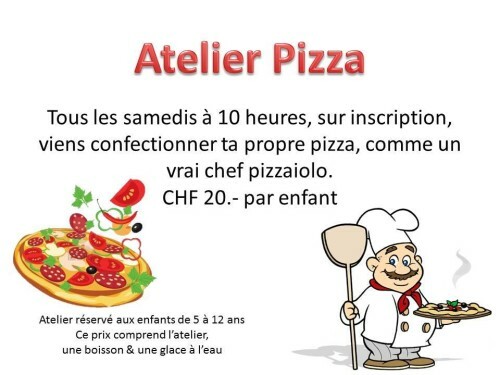 Saturday 12th December 2015: Atelier Pizza, every Saturday morning from 10.30am to 11.30am at Signal de Bougy. For ages 5 to 12, let your little ones learn the ropes of authentic pizza making with a professional pizzaiolo, they will also be able to eat up their yummy creations once they’re cooked. The workshop costs 20CHF per child, places must be reserved at signal.bougy@gmvd.migros.ch or +41 58 568 31 50. 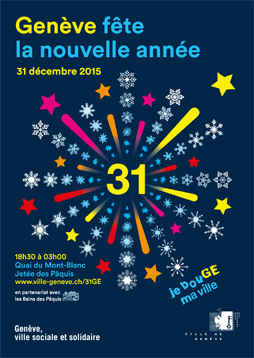 Saturday 12th December 2015: Fête de l’Hiver, in Saint-Julien-en-Genevois (France). A lovely Xmas event for the whole family with plenty of great activities including a Marché de Noël des commerçants; circus shows; story times for children; free street performances by Les Lutins à la neige, workshops for kids and much more. Follow directions for Centre Ville in Saint-Julien-en-Genevois, the Parking de l’Atrium will be free of charge on this day. FREE ENTRY. Saturday 12th December 2015: Cortège de Noël et démonstration du travail d’attelage de bouviers bernois at the Place de la Visitation in Gex (France). 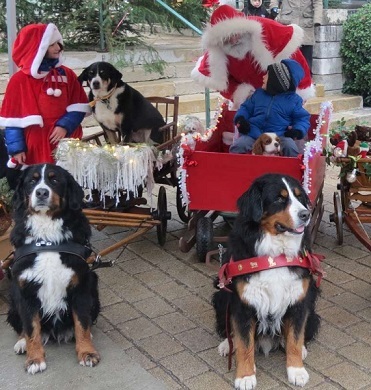 Share a cuddle and a chariot ride with these gorgeous Bernese mountain dogs from 2.30pm until 5.30pm. Father Christmas will be there too, so your little ones can take a photo with him! FREE ENTRY, a free snack will be offered to all children. 12th-13th; 19th-20th December 2015: free kids workshops at the Bains des Pâquis in Geneva (Quai du Mont-Blanc 30). These arts and crafts workshops for children will run from 2pm to 5pm and are free of charge. The meeting point is inside the restaurant right at the end of the cabane à fondue. 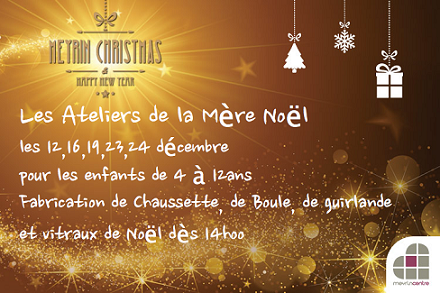 12th-24th December 2015: Si Noël m’était conté, free kids workshops, story times and visit from Father Xmas at the Meyrin shopping centre (Place des 5 continents). 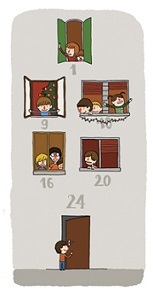 Xmas workshops for children aged 4 to 12 will take place on the 12th, 16th, 19th, 23rd and 24th of December from 2pm. Father Christmas will arrive on his sledge on Saturday 12th of December at 3pm, with plenty of candy for children! Sunday 13th December 2015: “Construis ton système solaire de poche – Atelier“ free workshops for children aged 6+ at the Muséum d’histoire naturelle, Genève (1, route de Malagnou). In connection with the current exhibition “Exoplanètes”, these free workshops will take place at 11am until 12pm on the second floor. FREE ENTRY, no advance booking necessary. Sunday 13th December 2015: “Sommes-nous seuls dans l’Univers?” – free guided tours for families and children aged 7+ and accompanied by an adult at the Muséum d’histoire naturelle, Genève (1, route de Malagnou). In connection with the current exhibition “Exoplanètes”, these free Sunday tours will take place at 2pm on all floors. 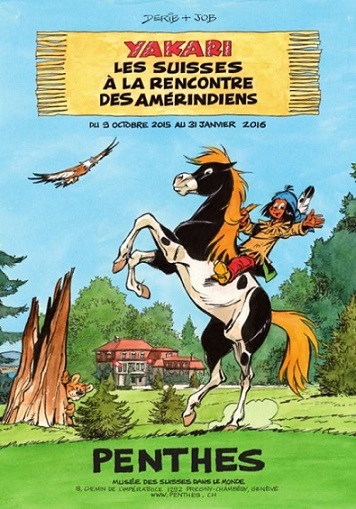 Sunday 13th December 2015: Cultures animées, free Animatou screenings suitable from age 8 in the Auditorium of the the MEG museum in Geneva (Musée d’ethnographie de la Ville de Genève, Boulevard Carl-Vogt 65-67). From 11.15am until 11.55. FREE ENTRY no advance booking required. Wednesday 16th December 2015: “Histoire en briques – ateliers enfants” at the Musée des Suisses dans le Monde in Geneva (Pregny). Suitable for children aged 4 to 12, these fun workshops running from 2pm until 4pm will include a visit to the exhibition and a workshop in French. Participants have to buy a ticket to the exhibition but the workshop itself is free, places need to be booked in advance at secretariat@penthes.ch or 022 734 9021. Children must be accompanied by an adult. Wednesday 16th December 2015: “Le Père Noël est en pétard”, stories and music for little ones aged 3+ at the Espace Grosselin in Carouge (Rue Jacques-Grosselin 31, sous-sol). There will be a performance at 2.30pm and one at 4pm. FREE ENTRY but places must be booked in advance here. Wednesday 16th December 2015: Jours d’ouverture aux familles at the Maison de la Créativité in Conches (7, chemin Calandrini). These family activities will take place in the afternoon from 2.30pm to 5pm. Entry is 3CHF per adult and per child aged 2+. Wednesday 16th December 2015: Le MAH à tout petits pas – Mercredi Family pour les tout-petits free guided tours for children aged 3 to 5 accompanied by an adult at the Musée d’art et d’histoire in Geneva starting at 10.30am and 3.30pm. No previous booking required, FREE OF CHARGE. Wednesday 16th December 2015: “Bandelettes et amulettes”, part of the Mercredis Family at the Musée d’art et d’histoire in Geneva (Rue Charles-Galland 2). Children aged 6 to 10 accompanied by an adult are welcome every Wednesday at 3pm to discover all about the museum collections in a fun, interactive way. FREE ENTRY, no advance booking required. Wednesday 16th December 2015: “Une vie ailleurs? Les extremophiles” workshop for kids – Animation du mercredi from age 7 at the Muséum d’histoire naturelle, Genève (1, route de Malagnou). In connection with the current exhibition “Exoplanètes”, these free Wednesday workshops will take place from 2pm to 4.30pm (second floor). Wednesday 16th December 2015: “Le Petit Rendez-vous et le livre” Petits Rendez-Vous for children at Geneva’s MAMCO. 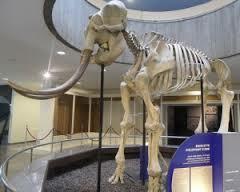 These are free, interactive guided tours for kids aged 5 to 10 accompanied by an adult. The tours start at 3.15pm. FREE entry, no advance booking required. 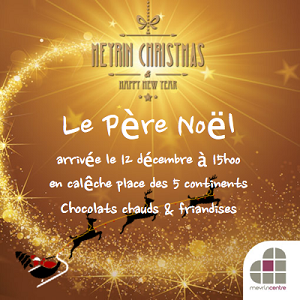 Saturday 19th December 2015: “Sacré Père Noël !”, Christmas show in French for children aged 5+ at the Bibliothèque de la Cité in Geneva (Place des Trois-Perdrix 5). The show starts at 3pm. FREE ENTRY, no advance booking required. Saturday 19th December 2015: Atelier Pop’up sur le thème de Noël, kids creative workshop in French at the Bibliothèque de la Servette in Geneva (Rue Veyrassat 9) at 10am for children aged 6 to 8 and at 2pm for those aged 9 to 11. FREE ENTRY, but places must be booked in advance at 022 418 37 82. Saturday 19th December 2015: “Dinosaures, fossils et autres aventures de la Terre Animation Géosciences”, fun workshops for kids aged 6+ at the Muséum d’histoire naturelle, Genève (1, route de Malagnou). A fun way to discover more about fossils and dinosaurs, these free Saturday workshops in French take place at 2pm, 3pm and 4pm. 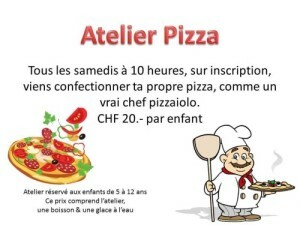 Saturday 19th December 2015: Atelier Pizza, every Saturday morning from 10.30am to 11.30am at Signal de Bougy. For ages 5 to 12, let your little ones learn the ropes of authentic pizza making with a professional pizzaiolo, they will also be able to eat up their yummy creations once they’re cooked. The workshop costs 20CHF per child, places must be reserved at signal.bougy@gmvd.migros.ch or +41 58 568 31 50. 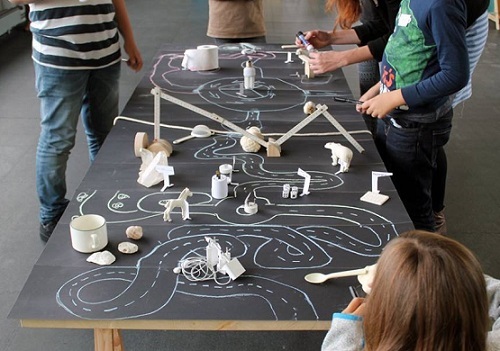 19th-20th December 2015: free kids workshops at the Bains des Pâquis in Geneva (Quai du Mont-Blanc 30). These arts and crafts workshops for children will run from 2pm to 5pm and are free of charge. The meeting point is inside the restaurant right at the end of the cabane à fondue. Sunday 20th December 2015: Coupe de Noël at the Jardin Anglais in Geneva. This is a unique and long-standing sport’s event in the city of international peace, now in its 77th edition. Watch as hundreds of people jump into the freezing lake for the world’s biggest swimming race in open waters. Participants include the so-called “groupes humouristiques” who participate wearing weird & wonderful costumes (including Santa hats!). The first group will jump into the lake at 9am, Santa will arrive at around 10am with plenty of gifts for the little ones. 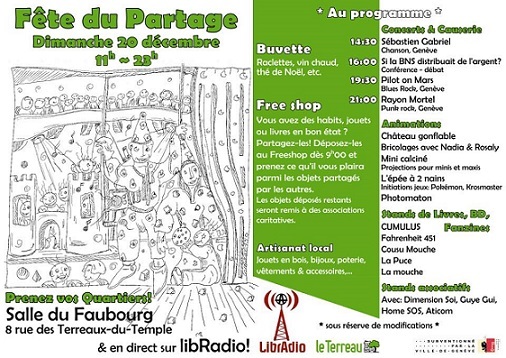 Sunday 20th December 2015: “Fête du Partage” from 11am until 11pm at the Salle communale du Faubourg in ‪Geneva‬ (Rue des Terreaux-du-Temple 8). FREE ENTRY. You will find live rock concerts by local bands; raclette, Xmas market and activities for kids including a bouncy castle, creative workshops and mini cinema. There will also be a “free shop” where people can swap or donate what they no longer need. Salle communale du Faubourg – Rue des Terreaux-du-Temple 8 – 1201 Genève. Tél. +41 22 418 98 28. Sunday 20th December 2015: “Construis ton système solaire de poche – Atelier“ free workshops for children aged 6+ at the Muséum d’histoire naturelle, Genève (1, route de Malagnou). In connection with the current exhibition “Exoplanètes”, these free workshops will take place at 11am until 12pm on the second floor. FREE ENTRY, no advance booking necessary. Sunday 20th December 2015: “Sommes-nous seuls dans l’Univers?” – free guided tours for families and children aged 7+ and accompanied by an adult at the Muséum d’histoire naturelle, Genève (1, route de Malagnou). In connection with the current exhibition “Exoplanètes”, these free Sunday tours will take place at 2pm on all floors. The guided tour in English “Are we alone in the universe?” will take place at 3.30pm. 20th December 2015: Oh! Oh! Oh! 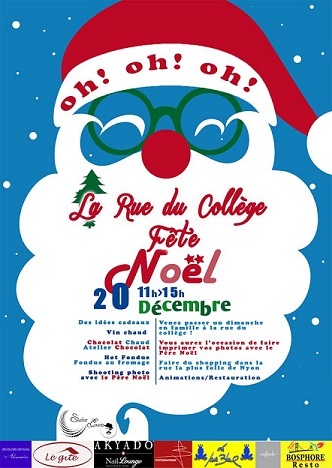 La rue du Collège, FÊTE NOËL !, free Xmas activities on the Rue du Collège in Nyon (VD). From 11am to 3pm there will be many fun activities for the whole family offered by local shops, including cheese fondue; hot chocolate and chocolate workshops at the Chocolaterie Alexandre; photos with Father Christmas and much more. Wednesday 23rd December 2015: “Le Petit Rendez-vous dont vous êtes le héros” Petits Rendez-Vous for children at Geneva’s MAMCO. These are free, interactive guided tours for kids aged 5 to 10 accompanied by an adult. The tours start at 3.15pm. FREE entry, no advance booking required. until 24th December 2015: Marchés de Noël at various locations around Geneva, such as the Quai du Général-Guisan and Carouge. 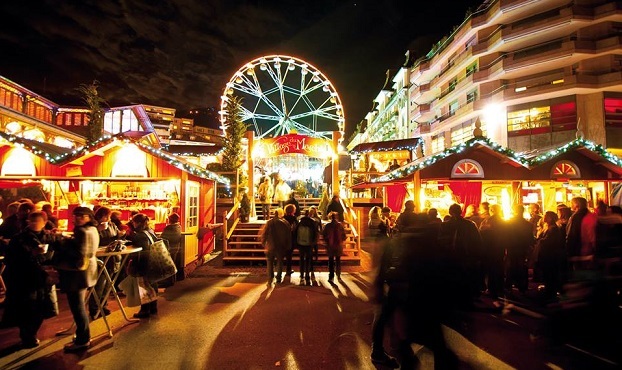 until 24th December 2015: Montreux Noël, an unmissable event if you’d like to kick off the festive season in style: from the shores of Lake Geneva to the surrounding mountain tops, Montreux Noël offers many activities centred around its traditional Christmas Market. 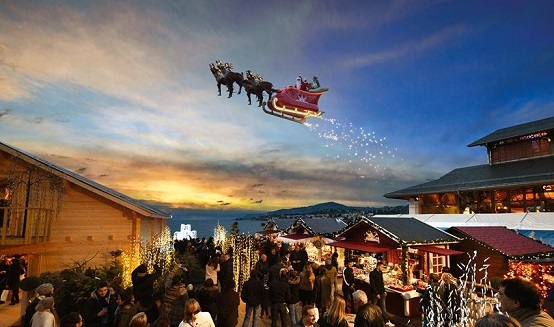 What’s more, following last year’s success, Santa and his flying sleigh will be back at the Marché de Noël in ‪Montreux‬ at the following times: Monday to Friday at 5pm; 6pm; 7pm. Saturday and Sunday at 4pm; 5pm; 6pm; 7pm. Tuesday 8th December 2015 at 4pm; 5pm; 6pm; 7pm. As well as the Xmas market, you can visit Santa at his house at the Rochers de Naye; discover an authentic Christmas Village in Caux or stroll through a medieval market and attend a story festival within the walls of the legendary Château de Chillon. Visit the official website for exact opening times and take a look at our previous post to find out how much we enjoyed our visit last year! until 24th of December 2015: Les Fêtes de Noël – Lausanne. This year, the Xmas celebrations in Lausanne are set to be a superb combination of Xmas markets to suit all tastes and styles (traditional, design, family etc.) and the third edition of the Festival Lausanne Lumières, which ends on the 31st of December 2015. You’ll definitely be able to see Lausanne under a different light! Wednesday 30th December 2015: “Le voyage en Californie” Petits Rendez-Vous for children at Geneva’s MAMCO. These are free, interactive guided tours for kids aged 5 to 10 accompanied by an adult. The tours start at 3.15pm. FREE entry, no advance booking required. 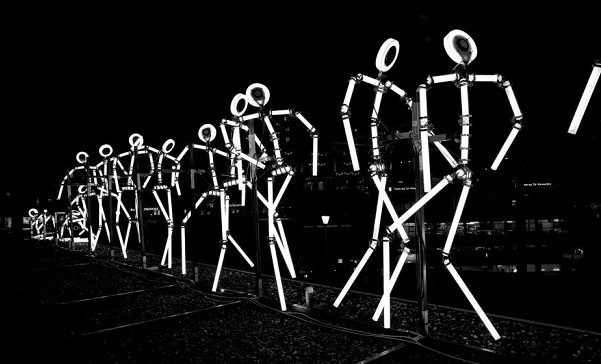 until 31st December 2015: “Festival Lausanne Lumières”, with no less than 14 original artistic illuminations installed in the heart of Lausanne. Each one of them will be using light as main element to give the city a contemporary, innovative and enchanting atmosphere during six weeks. The «Nuit du Festival» on the 20th of November 2015 will inaugurate the festival with guided tours specially dedicated to families (only in French). Each child will receive a Chinese lantern to travel along the festivals route. 31st December 2015: Fêtes de Noël et du Nouvel An à Genève. This year the Ville de Genève is pulling all the stops to offer its residents a great New Year’s party, organized in partnership with the Bains des Pâquis. Open to everyone, this free New Year’s party will take place along the Quai de Mont-Blanc and the Jetée de Pâquis. Get ready for the Disco Soupe, live DJ set and fun activities for all. 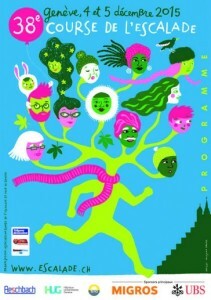 Find the full programme here. FREE ENTRY. until 3rd January 2015: indoor playcentre C l’Aventure in Annemasse (France) is open during the Xmas holidays from 10am until 7pm, except on Xmas Day and on the 1st of January 2016. You can find out more about C l’Aventure in our previous post. 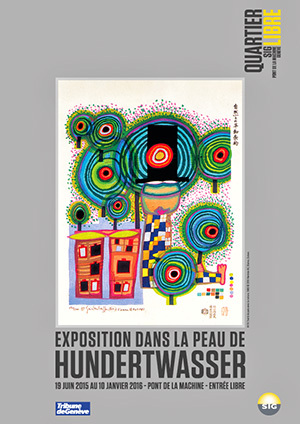 until 10th January 2016: « Dans la peau de Hundertwasser » free exhibition at the Quartier Libre SIG in Geneva (Pont de la Machine, 1). The exhibition will showcase the architectural designs, original graphic works and paintings by Austrian artist Hundertwasser. FREE ENTRY, workshops must be booked in advance at +41 (0)22 420 75 75 or exposition@sig-ge.ch. until 17th January 2016: LA CRECHE DE NOËL dans la ville, spectacular Christmas nativity scene at l’église Notre-Dame des Grâces in Grand-Lancy. 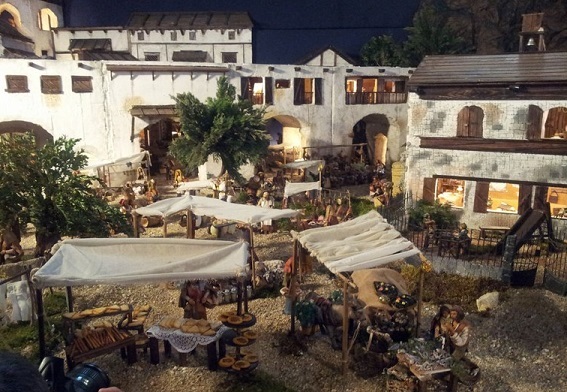 It’s a masterpiece of miniature scenes recounting the Christmas story, displayed across a surface of 90m². The nativity will remain open everyday until the 17th of Januray 2016, from 10am until 6.30pm (except during mass). FREE ENTRY, but donations gratefully accepted. until 17th January 2016: «Lascaux, chef-d’œuvre de la préhistoire» at Palexpo Geneva – Halle 7. As the official website says: “For the first time in Switzerland, discover the splendour of this UNESCO listed cave in an impressive life size replica and an exhibition spreading on 4000m2! 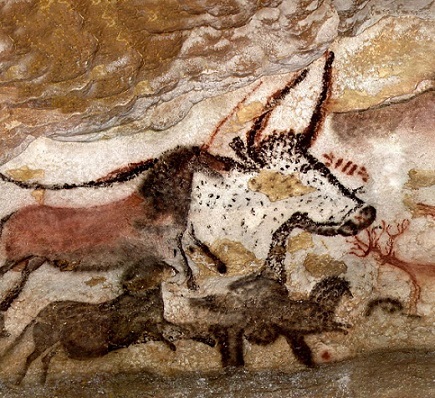 Thanks to the diversity and quality of the paintings, the Lascaux cave is one of the most important in the world. Discovered in 1940, the wall paintings are considered a treasure of paleolithic art. The exhibition will reveal the secrets of this fabulous cave and its masterpieces painted by our ancestors, the Cro Magnons, 200 centuries ago. Embark on a wonderful journey through time and enter the Lascaux cave, closed to visitors since 1963.” Make the most of the 16CHF discounted tickets on “Discovery Mondays” 7th and 14th of December; 11th of January. 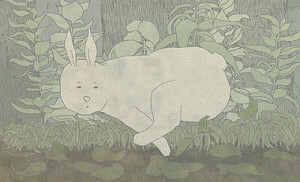 The exhibition is free for children under 6. Visit the official website for opening times and tickets booking. until 31st January 2016: “Yakari, les Suisses à la rencontre des Amérindiens”, new temporary exhibition at the Musée des Suisses dans le Monde in Pregny (Geneva). Definitely one for comic books fans! 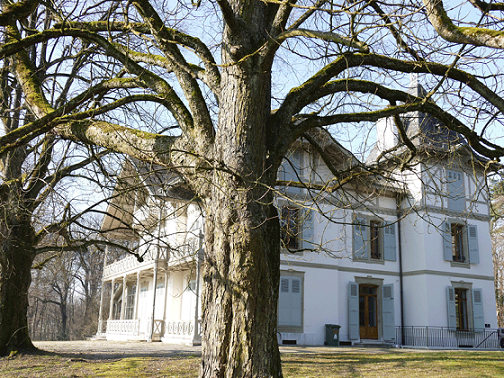 until 14th February 2016: “Histoire en Briques” at the Musée des Suisses dans le Monde in Pregny-Chambésy (GE). Read all about this fantastic and child-friendly new exhibition in our latest post! until 4th April 2016: Exoplanète, a great exhibition at the Muséum d’histoire naturelle, Genève (1, route de Malagnou) to celebrate the 20th anniversary of the discovery of the first exoplanète, a planet situated outside our solar system by the Swiss astrophysicists from the Observatoire de Genève, Michel Mayor & Didier Queloz. 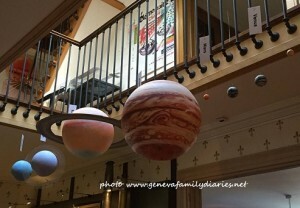 This exhibition is accompanied by a number of kids workshops, guided tours, astronomical observation and many more events in the months to come. until 4th April 2016: Terre & Soleil exhibition at the Musée d’Histoire des Sciences in Geneva (Rue de Lausanne 128). The exhibition explores the change from a universe centred on the earth to a dynamic system of planets orbiting around the sun. 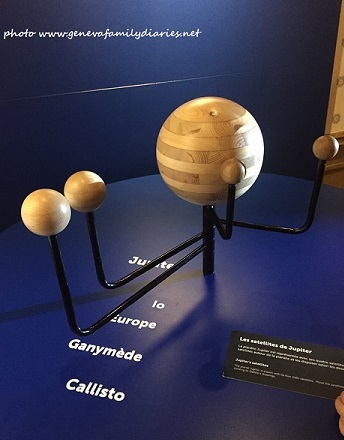 You can continue the journey beyond our solar system to the discovery of other planets, the exoplanets, with the current exhibition at the Natural History Museum in Geneva. The first exoplanet was discovered in 1995 by Michel Mayor and Didier Queloz, while they were working for the University of Geneva observatory. 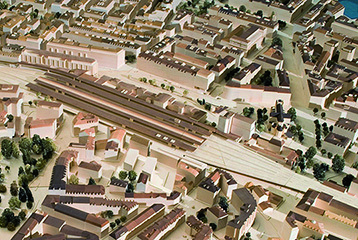 until May 2016: Exposition de la maquette de la ville de Genève. The architectural model of the city of ‪Geneva‬ looks pretty awesome, it comprises of 145 modules and it took 40 years to complete! It is now on display for the first time and open to the public on Wednesdays, Thursdays, Fridays and Saturdays from 11am until 6pm at the “Exposition de la maquette de la ville de Genève” — 25 rue du Stand — Geneva. The exhibition opened on the 15th of April 2015 and will run until May 2016. You can call +41 22 418 20 63 for more info or to book a guided tour. 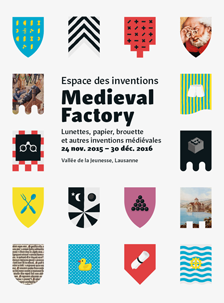 Until 30th December 2016: Medieval Factory, interactive exhibiton suitable from age 7 at the Espace des Inventions in Lausanne. Discover all the great medieval inventions still in use today! Free entry on the 1st Saturday of each month. Open Monday to Saturday from 2pm to 6pm; Sunday and Bank Holidays from 10am to 6pm. Tickets are 7CHF for adults and 3CHF for children. © Copyright 2013 Espace des Inventions. Tous droits reserves. 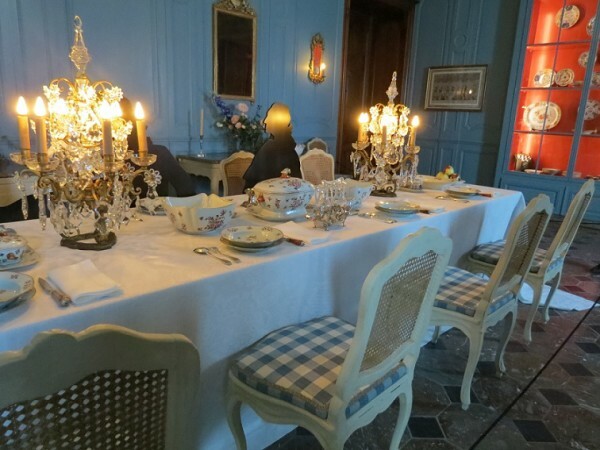 The permanent exhibition “Noblesse Oblige” at Prangins Castle is a great day-out for the whole family, take a step back in time with your children to see how a noble Swiss family lived in the 18th century! Find out more about this fantastic family exhibition in our previous post.